Due to conflicting information all over the web and this site as to which way to orient the CV Joint for installation I contacted the GKN Driveline factory to get the final word, at least for GKN Lobro CV Joints. 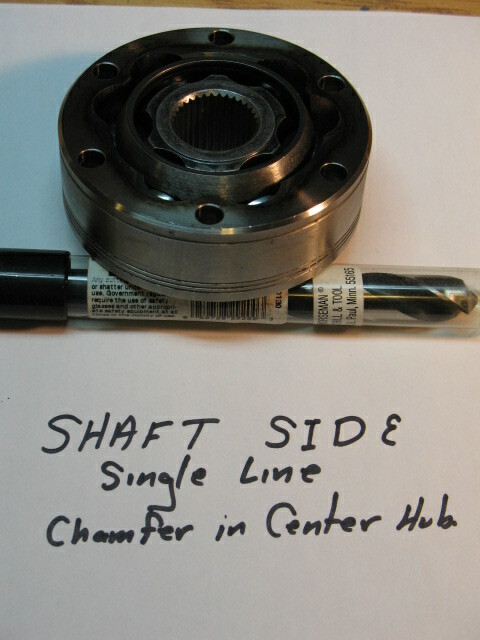 Per the email I received with the drawing, the single line side goes to the shaft and the three line side goes to the flange. 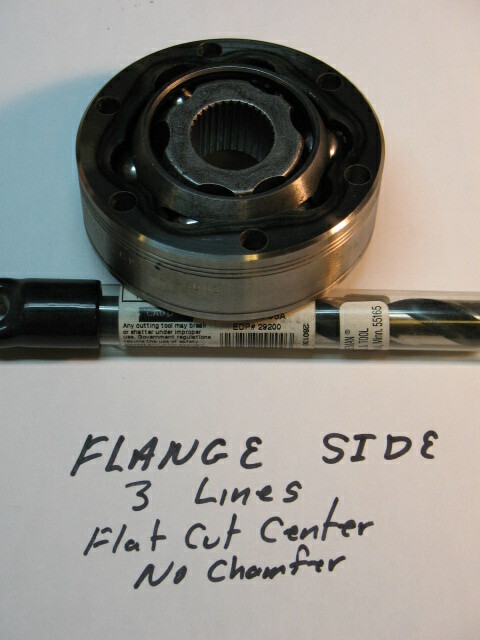 the center hub on the single line side also has a chamfer and the three line side of the center hub is flat cut with no chamfer. 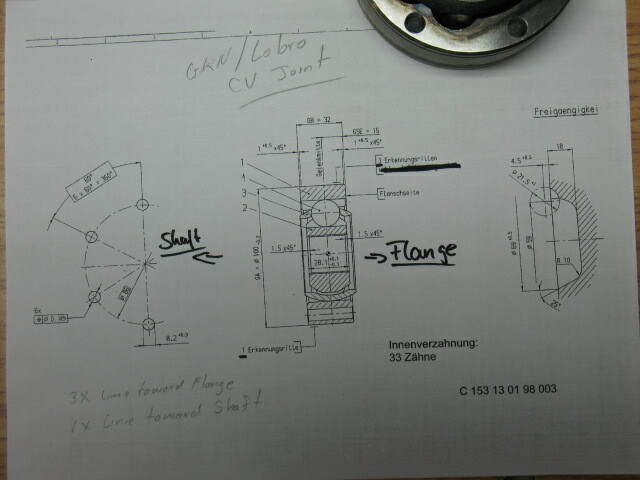 Below is the drawing and pictures of a GKN Lobro CV Joint from both sides. That's awesome work. Maybe this could be merged with the thread with the link that aeromech put up showing how to reassemble a CV and made into a sticky...? Thanks for posting this. I packed my new lobros last night, planning on mounting them today. This was my question. I've never seen a joint with 3 grooves on one side. And that single groove is opposite the flange. Most joints only have one groove. And depending on the source, that single groove sometimes is inside and sometimes is outside. These were Lobro's, as for other off brands I have no idea. The ones we had also show 3 and 1. So my Lobros came today in the mail so I figured this should be a fun messy project. Well have a few questions. I had to use a large round cylinder to help drive the CV joint onto the axle. One side went on pretty smooth and the other I had to give her a few hard taps to get her all the way seated back. Other thing to note is the one side that went on hard the circlip fit real nice and tight. The other easy side the circlip spins and seams lose I need to get some longer handled pliers to tighten it up. Where did I go wrong. ANy pointers? Way back when i was a tech i would put the new CV's up inside the shop heater in the winter time to warm them up before installing them. As for the loose circlip if you have up and down play even with the new style joints that have the "built in thrust surface" you may still be able to install one of the old washers to remove the excess play. Or, if you are saying the Snap ring is just to loose take it off and bend it a little. Pince it before putting it on or much better yet is a new one. Was the groove in good shape? yep new..maybe I open it to far during installion. I will pull it off and try to tighten it up and reinstall. I had to call it a day. Way messy job. Thank god for rubbe gloves and shop towels. And I for got to change clothes into something I could toss. To excited to get the job going. I bet you learned the importance of taking a leak and turning off the phone before you started. so true. Learning all the way. And i have made similar boo boo when the with comes in the shop and breaks my stride. one of the first reads for sure. and many threads and bently. and you tube. It seems i may have done ok. I am so hard on myself, want perfection all the time. For it being my first axle rebuild it will insure my next is near perfect. I hope. For all the tool geeks out there. These are some old craftsmen snap ring pliers, or reverse pliers. They haven't been made for a while. But you can still find them on Ebay. And you would think they were custom made for the circlips. Some even have dimples on the tip that hold the clips that much better. Good stuff. Thank you very much for this. I will be putting new boots on my bus and while I am there I will repack the bearings. I am assuming I need to clean off the old grease before I repack it, correct? I am assuming I need to clean off the old grease before I repack it, correct? yes. Dry and inspect too. This post started years ago because of conflicting information I saw about proper CV joint assembly. There is still conflicting information out there, but in my assembly I'm going with the orientation provided by the original poster who contacted the GNC Lobro factory directly. I had been following the Van Cafe writeup on CV joint assembly until it seemed to conflict with other information on orientations of the 3 main parts. Also, the Van Cafe article shows a Lobro joint with only one groove on the outer ball hub, and the ones I just received from them have 4 grooves total. There seems to be no dispute that the chamfered edge of the ball cage goes in, or toward the axle. What seems to differ is which side of the inner ball hub goes in. It seems to me that the Van Cafe article is showing what I believe to be the wrong direction to install the inner ball hub, with the more rounded edge toward the axle. When I called Van Cafe I was told that the more rounded edge faces out, or away from the axle which is what the Lobro factory said. Also, Van Cafe said that it doesn't matter at all which side of the outer ball hub goes in or out. Like I said, I was following the Van Cafe writeup, but am glad I found this post because I think this is the correct way. Any comments? What seems to differ is which side of the inner ball hub goes in. I.D. chamfer towards the shaft and flat end with no chamfer against the clip. And the sharpest edge of the clip towards the shaft end and not against the hub. But I don't think any of the CV's on either my bug or bus have Lobros. At least I don't think any have 4 outer grooves.